Robotic Process Automation Market size was over USD 600 million in 2016 and is predicted to grow at an estimated CAGR of over 20% from 2017 to 2024. The need to eliminate human intervention from tedious or time-consuming business processes, which are less complex, rule-based and do not require human decision making is anticipated to drive the RPA market over the forecast timeframe. Moreover, the need to enhance the operational efficiency, agility and performance of the organization will contribute in the overall industry growth. The technology aims at revolutionizing the way businesses operate, support processes and remote infrastructure. The companies that have labor-intensive processes and staff that perform high-volume, huge transactional process functions, have widely adopted the technology to boost their capabilities and save money. In addition, the growing popularity of the business process management (BPM) solutions is surging the demand for automating the processes by the companies to remain competitive in the industry. The major concerns associated with the usage of the technology are the business concerns and practical implications. Organizations cannot be effective with their digital strategies without automating processes intelligently, which may inhibit the market growth. Furthermore, the lack of technical know-how regarding the implementation of the technology may hamper the adoption. The outsourced RPA require service providers to offer enterprise level, robust solution that can support that highest capacities. Large enterprises in the RPA market are implementing the technology owing to the increasing need to streamline business process and to offer better management capabilities. The technology delivers a centralized platform to monitor & control business processes and helps in analyzing & auditing the information. Moreover, the technology enhances the regulatory compliance by integrating and conforming the log files from BPMS, ERP and ITPA systems. The rising adoption of the technology is accredited to the growing usage by industry giants such as IBM and Xerox Corporation to improve the productivity and reduce the overall costs. This has led many large firms to integrate the technology to get better ROI, which is escalating the robotic process automation market size. Furthermore, the integration of RPA with other digital technologies such as the machine learning, artificial intelligence, and natural language processing (NLP), are grasping additional value by achieving intelligent automation. Training services accounted for significant revenue share in 2016 due to the need to offer the knowledge regarding the implementation of RPA processes within an organization. The penetration of various academies to provide hands-on training on the service platform and the business requirements for rapidly deploying the solutions is contributing towards the RPA market growth. The professional service is anticipated to grow over the future owing to the need to automate the low value tasks such as large volumes of data entry and the need to remove the degree of human errors across different verticals. This will provide growth avenues for the robotic process automation market. The rule-based operation segment had the largest share owing to the ability to use advanced computer software which can systematize the rule-based processes. They are developed with pre-defined statements embedded in the software system, which can function without the need for continuous human supervision. The rule-based processes are trained according to the functional specification of the processes and can be altered anytime which offers flexibility to the companies to modify the processes based on the requirements. The automated solutions are gaining traction in the industry owing to the rising demand by the companies to automate the basic processes such as customer queries. This helps them in focusing on their core competencies and using predefined solutions for less complex tasks. Repetitive tasks such as proposal submissions, timesheets considerably minimize workforce productivity and may result in a less efficiency. The automation of these tasks will help in increasing the competitiveness of the company and enable the firm to utilize the full potential of the resources. It also helps the human counter parts to focus on the strategic decision making and enhance the effectiveness and efficiency. The process based tools are gaining traction in the industry owing to the rising demand to streamline the basic processes such as non-voice processes. It helps the companies in increasing the speed of their processes and gain more operational benefits. It also helps in analyzing the performance of the processes and thereby, seek ways to improve them substantially. Furthermore, it governs the operations of the company as it establishes measures to evaluate the process to offer strategic support. BFSI applications are the largest adopter in the RPA market as it is a highly regulated sector and automated solutions are offering a cost efficient and rapid way to cater the regulatory compliance issues by bridging the gaps between the ERP and BPMs systems. RPA enhances the accuracy and efficiency of different processes in the BFSI industry, which provide avenues for the robotic process automation market. These solutions also support in balance sheet settlement by assembling figures from different platforms and conducting an array of validation checks to make information available for a detailed analysis. The telecom and IT industry is anticipated to witness significant growth over the forecast timeframe to bridge the gap between large backed digital transformation projects. RPA can accomplish this with a virtual workforce that rationalizes existing processes, provides the foundation for intelligent automation, and releases the employees for more engaging work. 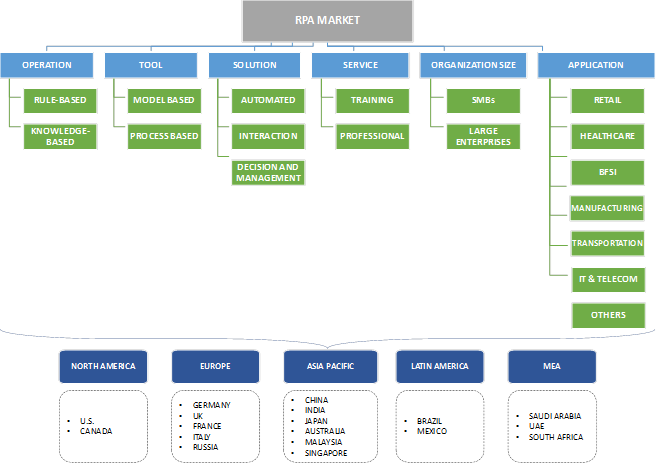 Australia RPA market is anticipated to witness a significant growth over the forecast timeline owing to the need for customer support and request processing requirements across industries such as the banking, insurance, government, and telecommunications. The rising demand for automation in the country to reduce the business process cost in an organization will drive the industry size. The Europe robotic process automation market will witness a surge owing to the presence of manufacturing and logistics firms in the region. The technology may help these industry verticals by operating with fewer number of people or shortage of labor, thereby, cutting on the cost and streamlining the resource allocation. It also helps in transforming the pickup and drop processes to gain considerable improvements in the cycle time, and better customer experience. 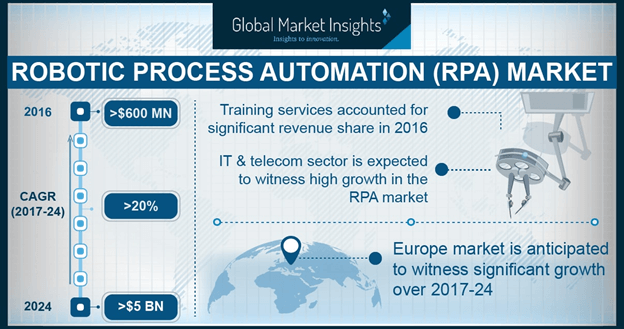 The players in the robotic process automation market include Blue Prism, Automation Anywhere, Celaton Ltd, Ipsoft, Pegasystems, Nice Systems Ltd., Redwood Software, Verint, Uipath and Xerox Corporation. Blue Prism. The companies are constantly innovating their offerings to meet the demands of business automation processes. In addition, companies are making huge investments in the technology to gain ROI which will further escalate demand. Mergers and acquisition strategy is being used by the industry participants to increase their presence. Furthermore, the industry participants such as Automation Anywhere are expanding their customer bases to cater to more customers. The Asia Pacific region will witness high growth owing to the presence of various shared services and BPOs in the region which necessitate automation requirements. The demand for enhanced customer support and reducing the cost of the business processes will further fuel the industry. Surge in the demand of virtual workforce to eliminate tedious human tasks and decreasing costs of automation software and services.